With important dates, new movies and a TV show coming along based on Star Trek, I thought it would be appropriate to take a look at the history of Trek in arcades. I’ve long been a fan of Star Trek – I was five years old when Star Trek: the Next Generation came around and I was hooked on the show immediately. Of course where I am also an arcade fan, what better way to enjoy both than to look back at the history of Trek in arcades and how it has been involved in the coin-op arcade industry. This will include pinball machines and games that didn’t carry the title of Star Trek but were essentially Trek without the license. 1: Star Trek by For-Play (1972) -Shortly before Pong made waves around the country, a small company decided to try their hand at making video games and for their first project they made a clone of the first but not-so-successful coin-op game Computer Space. That clone was named Star Trek, by For-Play. The Star Trek name was not licensed to the company but in the early and mid-70’s it wasn’t uncommon to see game companies doing this (for example, Atari would create a Jaws game a couple of years later without any license). For-Play’s Star Trek did change one thing from Computer Space though – it simplified the controls from several buttons down to a joystick. Otherwise it was the same game but it didn’t really capture anyone’s attention at the time and it would not be long after that that Atari would release Pong which then started the video game craze. It is interesting to note that this Star Trek game was technically the second coin-op video game and not Pong but it probably would have done a little better had they not just decided to rip-off Computer Space pixel for pixel. 2: Starship 1 by Atari (1977) – While this does not carry the name Star Trek anywhere on the game, when you play it is quite obvious that Starship 1 was heavily influenced by the show. One might say that Starship 1 takes place in an alternate ST universe with you piloting the “Starship Atari” to save the Federation. At your disposal is a yoke controller with one button to fire your phasers, another on the control panel to fire your “proton” torpedoes and a throttle control for speed. In the game you pilot the starship, shooting down enemy ships that appear on the screen while trying to avoid crashing into planets that constantly appear in your path. It is from the enemies where the game takes on even more from Star Trek – some ships are very close in design to Miranda-class ships (in fact this game pre-dates Star Trek II). It also used other designs that were obviously from Star Trek like a weird version of the Doomsday Machine (which have a huge face with a tongue sticking out) and Klingon BattleCruisers. This game was notable for its detailed graphics (for the time) and the sprite scaling effect that would become very popular in the late 80s. 3: Space Wars by Cinematronics (1977) – The very first game to use a vector monitor happened to be the best selling game that year and it also happened to have some Star Trek influence to it. The space war concept was not anything new – students had been creating a game like this for computers at universities for some time already but this would mark the first time that the concept would come to the public. The idea for this game was enhanced by space battles people had seen in Star Trek with the Enterprise engaging alien space craft. In fact for Space Wars, the second player ship is actually a Constitution-class starship. The game came in a huge cabinet and featured a control set that would be copied in later games like Asteroids and it also featured a number of variations that players could choose from, such as a sun or black hole at the center and more. I have read that this actually came out in 1976 but many sources say 1977. Either way, here’s a short video of the game in action. 4: Orbit by Atari (1978) – Orbit was Atari’s answer to Cinematronics Space Wars but instead of using a vector monitor, they opted for a raster (standard) monitor. This took the Star Trek influence up a notch however as you could play as either the starship Enterprise or a Klingon Battle Cruiser. This game also included many game variations like Space Wars did and it also was among the first Atari games to use professional, comic book style side art but the game did not do as well as the aforementioned title. Atari would later make up for this with their color vector game, Space Duel. 5: Star Trek Pinball by Bally (1979) – Often overlooked when it comes to gaming, Star Trek also has often appeared in the pinball arena – moreso than on the video game side if you are looking for official licenses. 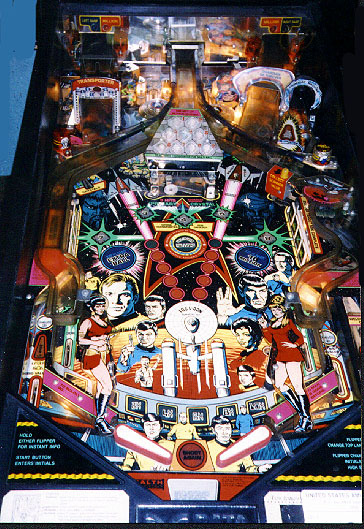 The first officially licensed Star Trek pinball game was created by Bally and features artwork that ties it to Star Trek: The Motion Picture (as you can tell by the uniforms and the design of the Enterprise on the backglass). That said, it was not a TMP game, involving other art assets from the Original series. The game was actually released prior to ST:TMP by several months which is probably why it didn’t carry a stronger TMP theme. This was a solid state game that could handle up to four players but as it was made prior to the use of speech in pinball machines, it would seem bland to many players these days. As a side note, pinball maker Gottlieb did release a Star Trek pinball in 1971 but the game had nothing to do with the TV show; Bally also had developed a pinball game in 1976 called Star Ship which had the Enterprise drawn on it’s backglass and side although there is only one Star Ship pin known to have been made, according to the Internet Pinball Machine Database. Here’s another video of ’79 ST Pinball game in action, although it was modified to play pinball by itself, which is a pretty cool project in it’s own right. 6: Star Trek: Strategic Operations Simulator by Sega (1982) – The first official Star Trek video game also happens to be one of the best if you ask me, this coin-op game by Sega. Based upon the Kobayashi Maru scenario from Star Trek II: The Wrath of Khan, you command the Enterprise through various levels taking on Klingon ships who are attacking the starbase in each sector. The screen is split into three sections, one for stats, one for a top down view of the area and the other the main view screen. The player can fire either phasers or photon torpedos (which have quite a large blast radius) or jump into warp speed quite easily to complete each scenario. You also will face Nomad and other obstacles as you progress throughout the game. Thanks to it’s color vector monitor, the game still looks amazing today. The only problem was that this vector monitor type was prone to overheating so it didn’t fare too well with arcade operators who saw it as a big risk/headache on repairs. The cabinet was released in two versions, a standard upright version and a far cooler sit-down version which included a Captain’s chair, with the game controls built into the arm rests. This game also featured great synthesized speech, all put together to make you feel like you were in a Federation simulator. Sega ported this game to several home game consoles including the Atari 2600, Atari 5200, ColecoVision and the TI 99/4A (the TI having the best port out of all the versions). 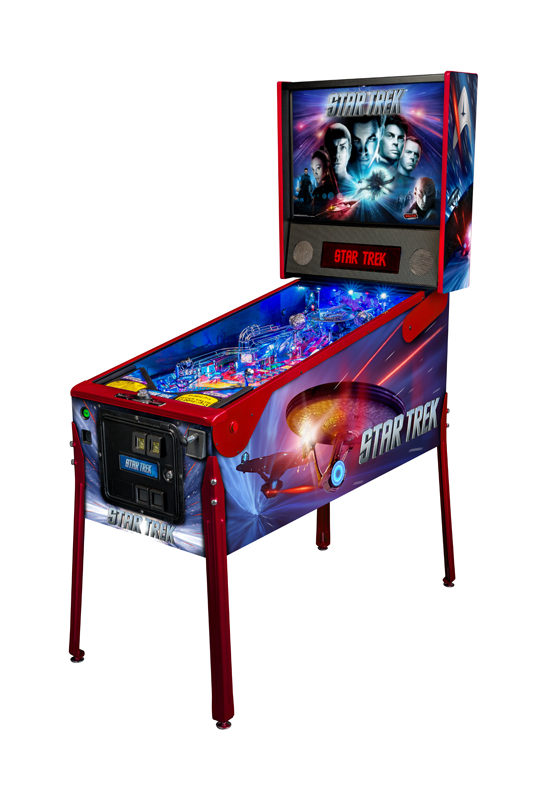 7: Star Trek 25th Anniversary Pinball by Data East (1991) – After a long hiatus, Star Trek returned to pinball to celebrate the 25th anniversary of the show. This offered a more modern and exciting design than the previous effort in 1979. All of the artwork on this game is dedicated to the original series TV show. Several popular characters and objects make an appearance in some manner in the game, such as the Klingons, Orion Slave Girls, the Gorn, the Talosians, Tribbles, the Guardian of Forever, the Doomsday Machine, the Space Amoeba and even alternate evil universe Uhura. 8: Star Trek: The Next Generation Pinball by Williams (1993) – As you can tell by now, most of the arcade Trek entries have been focused on “TOS,” or The Original Series. As popular as Star Trek : The Next Generation was, it is a little strange that the only place it can ever be found in an arcade is in the form of a pinball machine. That said, this game consistently wins over pinball fans in terms of playability, gracing the top 10 ratings list for quite a long time. It was designed by pinball legend Steve Ritchie. First off the game is a wide-body, so the playfield is larger than your standard pin, Using that extra space, they managed to cram quite a bit into the game. There are model toys of a Romulan D’deridex-class Warbird, a Klingon Bird of Prey, a standard Federation shuttlecraft and most prominently, the Borg ship seen in the Season 6/7 episodes “Descent“(I have seen an upcoming mod that replaces with with the better known Borg cube). 9: Star Trek: Voyager by Team Play (2002) – The last Star Trek game to grace the presence of video arcades would be Star Trek Voyager, a light-gun shooter where you must take on the Borg who have assaulted Voyager once again. As a light-gun game it was fairly simple but as a Trekkie I found myself being slightly irritated by the fact that they decided to use fairly standard gun cases instead of creating some molds that looked like phasers from the show. I personally didn’t care much for this one but you can still come across it today at many arcades. Like the other Star Trek video effort by Sega, this was created in both standard and deluxe (sit-down) configurations. The deluxe style cabinet is certainly impressive due to it’s large screen and footprint where players can sit-down inside to enjoy blasting the Borg but when it comes to graphics, the game has not aged very well (like many older 3D games). 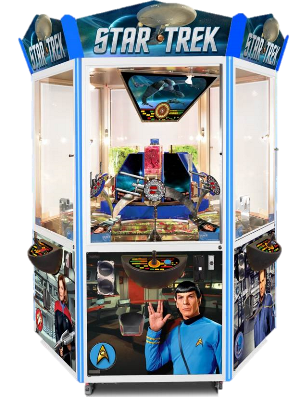 10: Star Trek Pinball by Stern Pinball (2013) – Neither Deep Space Nine nor Enterprise got any love from the arcade/pinball side of things but with the reboot by JJ Abrams, Steve Ritchie wanted to get in on the action once again. Pulling elements from Star Trek (2009) and Into Darkness (2012), the player selects their ‘mission’ before launching the ball then you proceed to unlock events within those missions to clear it out. You can also win Bronze, Silver and Gold medals for your performance here. This eventually featured voiceovers by Dr. McCoy actor Karl Urban, a welcome update that really gave the game some more depth as well as character. “Dammit Jim I’m a doctor, not a pinball wizard”. Overall I really enjoy the audio package to this one as it does not rely solely on sounds from the reboots, using many cues from the original series. This was released in 3 flavors – Pro, Premium and Limited Edition. The latter two were the first that Stern had released to use multi-color LEDs and a redesigned backbox. Speaking from personal taste, when I played the Premium at a trade show(pictured above), it sold me on my first pinball table that I had bought in years. 11: Star Trek Arcade by Elaut USA (2016) – I suppose this is sort of a stretch, kind of like Star Trek themed slot machines but at the moment you can come across this prize pusher game at Dave & Busters to win collectible cards. What is next for Trek in arcades? Star Trek has not been as prominent in arcades as series like Star Wars has been. In part that is because Star Wars more easily translates to arcade action thanks to space dogfights while Star Trek generally has slower moving and bulky space ships duking it out (and not in every episode either). I still believe that the possibilities of what could be done are many; In the original article, I stated that: “Stern could easily create a new pinball machine based upon the new movie but such a game would have had to be in the works for a while already to be released in time for May.” I was referring to the 2009 reboot but my suggestion must have been heard in the ether for a release in 2013. A reboot of the original Sega classic would still work although audiences have shown less of an appetite for games like that than they have other genres. A new light-gun shooter could work out better than Voyager did, and it could be based in any one of the ST series. The Dominion Wars from DS9 or the MACOs from ENT would probably work best although I am sure Paramount/CBS would probably want a new video game to be based on the reboots or the upcoming Discovery TV show. If Namco wanted to offer an update for the Star Wars Battle Pod or re-use the cabinet, piloting a Defiant-class starship into battle would probably work out for that style of game. As for racing….no. Space racing games just never feel right and that’s one place where Star Trek doesn’t need to waste a license. NOTE: This article was refreshed on September 8th 2018 for some minor corrections to the text & formatting. 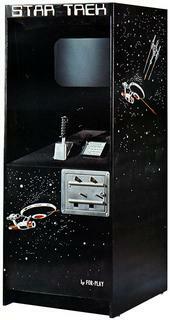 I had two of those 1979 Bally Star Trek machines in my arcade, side by side, as well as TNG pin. All three got a lot of play, as people would play TNG (when that ! @#!^$%# thing was working, dammit! Was there EVER a day when something wasn’t wrong with that damn thing?) and then play the other one out of curiosity. ST pinball was the best! thx.